Over the coming weeks, we’ll release a series of blog posts on how you can use the JFrog CLI, Artifactory, and GitHub Actions to build awesome software. 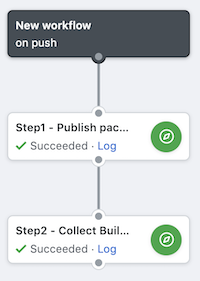 Last week we built a Go app using Artifactory, the CLI and GitHub Actions and this week we’ll continue that by publishing the Go app as a module. Go modules are collections of related Go packages that are versioned together as a single unit. Those “units” make it possible to share the code between developers without asking them to download the code over and over. 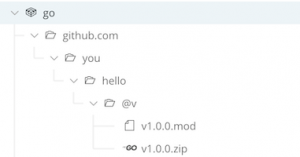 In this post, we’ll use a built an app and store the module in Artifactory using the JFrog CLI. The first step is to publish the module to the Go repository in Artifactory. You can use any version you want (like v1.0.0) and use the --build-name and --build-number flags to record the uploaded module as an artifact as well. As mentioned in the previous post, Build Integration is one of the most awesome features of Artifactory and the JFrog CLI. You can collect and store that in Artifactory so you have an immutable log of what happened during the build step. The reason that you need to execute two commands (the args are now an array) is that the GitHub Actions workflow only keeps the working folder and discards the rest from step to step. The JFrog CLI stores the build info it collects in a separate folder, so when moving to another step it would otherwise lose that. Only two ✅, and everything still works! 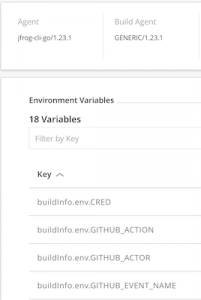 [Info] Collected environment variables for my-build/1. …in the build information section. From there you can see all the environment variables and other data that was recorded during the build!